I’ve been wanting to share more about our trip to Washington DC every day since we got home, yet life got in the way over and over again. So, today I’m excited to share a little bit more about our trip. 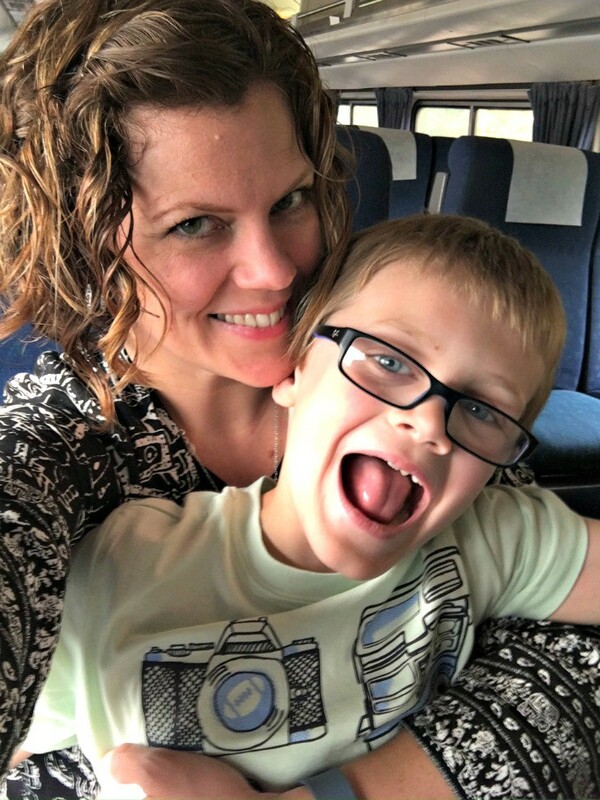 Or I should say, how it all began…I’ve narrowed my thoughts down to 3 reasons why I think train travel with kids is a great idea for a weekend getaway. 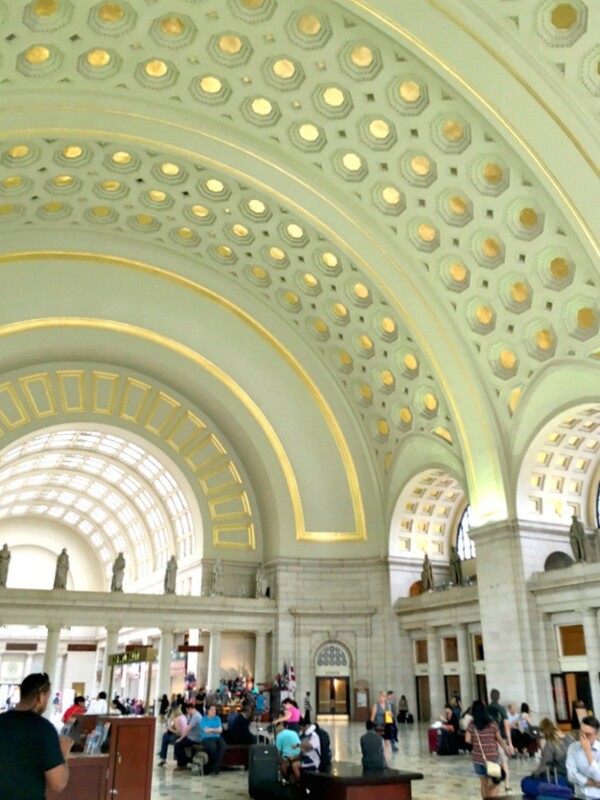 We live close enough to drive to DC, but when we thought about driving around town and dealing with parking fees, we thought why not just take the train? 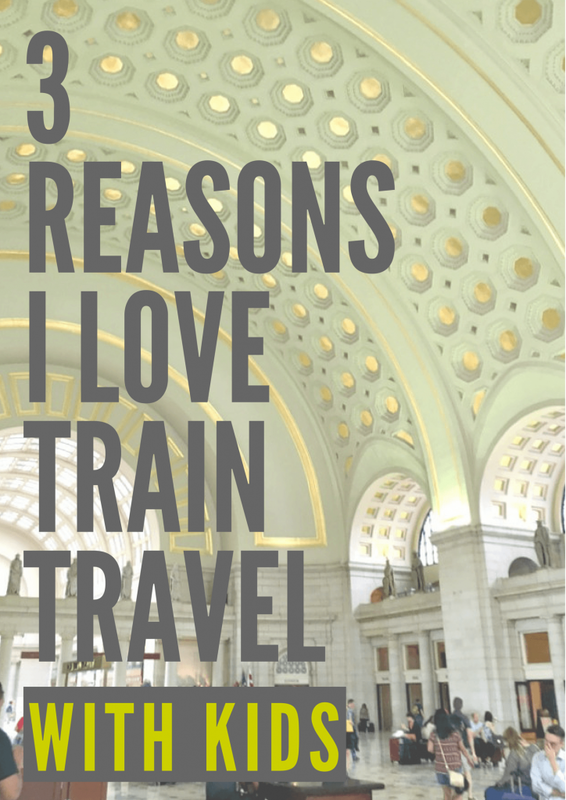 I love train travel and it’s not the first time Jerry and I have done a train trip. But the boys had never traveled this way and we thought it would be a fun way to get our vacation started right here in Raleigh! It’s fun to take the train! It’s a quick 5 and a half hour ride from Raleigh to DC so it’s long enough to get comfortable but short enough to stay novel. 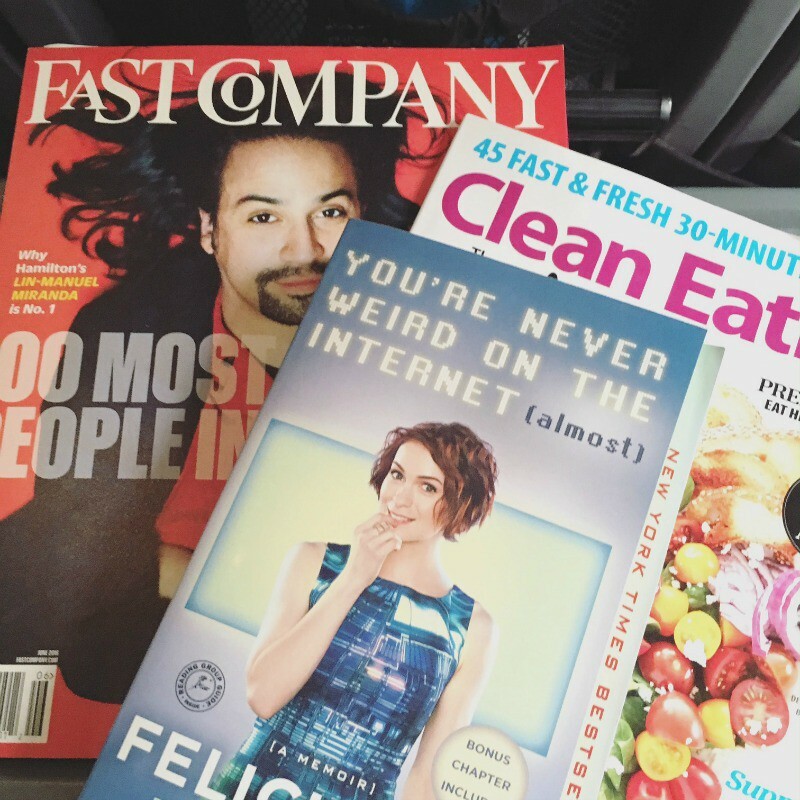 We opted not to bring any electronics for the boys on this trip and I am glad we did. But maybe next time we would stash some at the bottom of our bag for the trip home when everyone is exhausted. 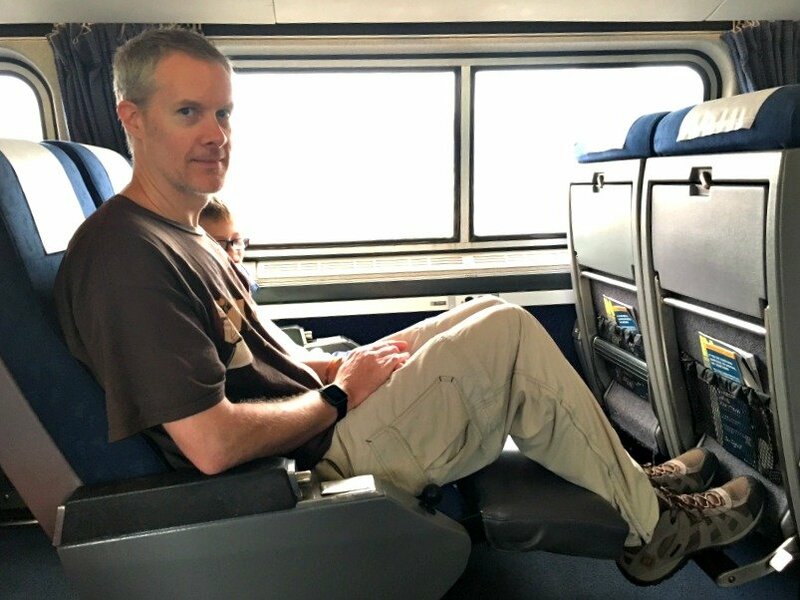 Taking the train means your vacation starts right away. With no stops or bathroom breaks to worry about, we were all able to get into vacation mode right away. 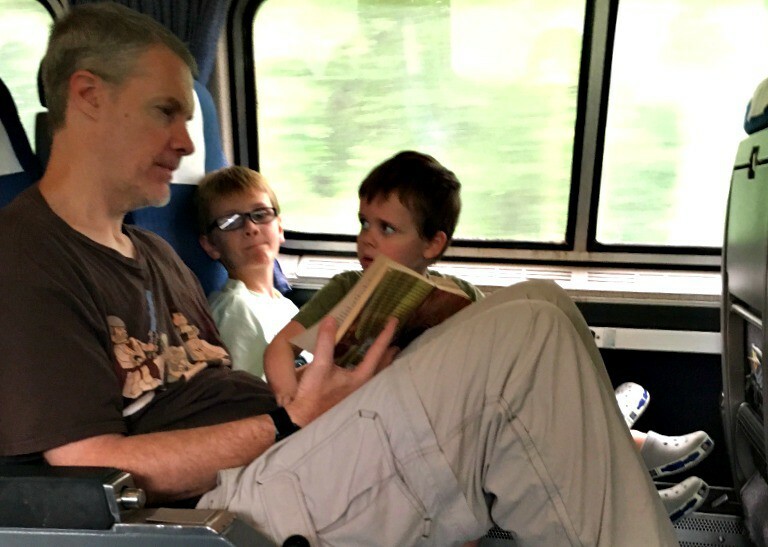 I brought magazines to read, we played cards and Jerry read Harry Potter to the kids as we rolled down the tracks. 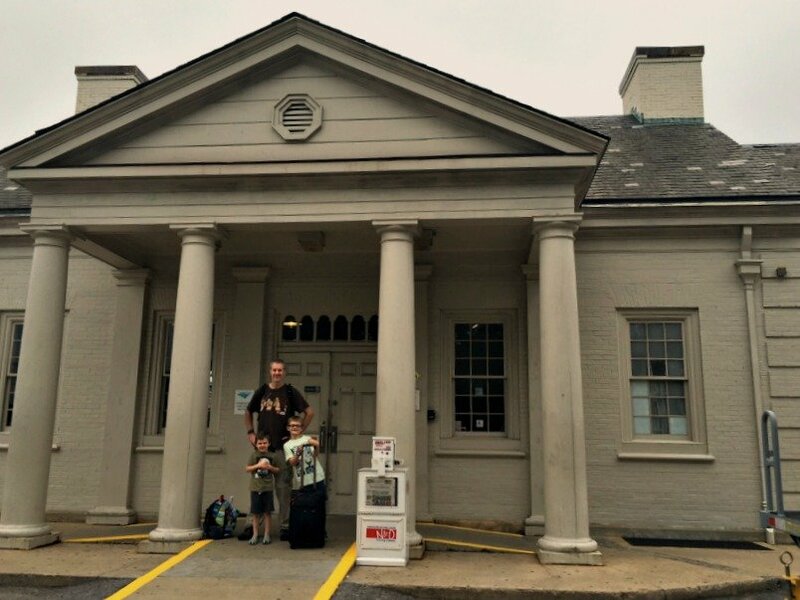 To take Amtrak round-trip from Raleigh to Washington DC using my AAA discount, the final price tag was just under $300 TOTAL for all four of us! 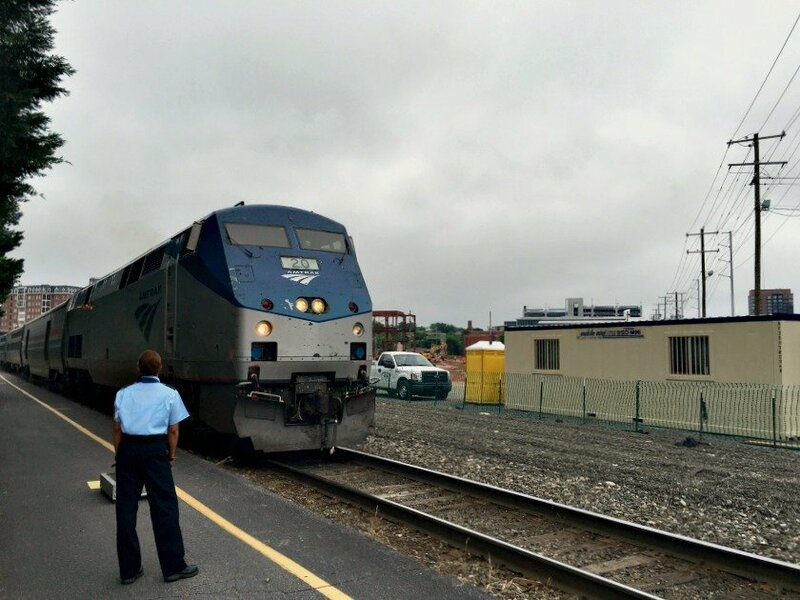 Even if you don’t compare that to flying, when you take into account parking fees in the city and gas for our minivan, taking the train was the most economical choice for us. Money Saving Tip: Food on the train is another story. To really maximize your savings, make sure to pack a bag of snacks to enjoy on the way to your destination. 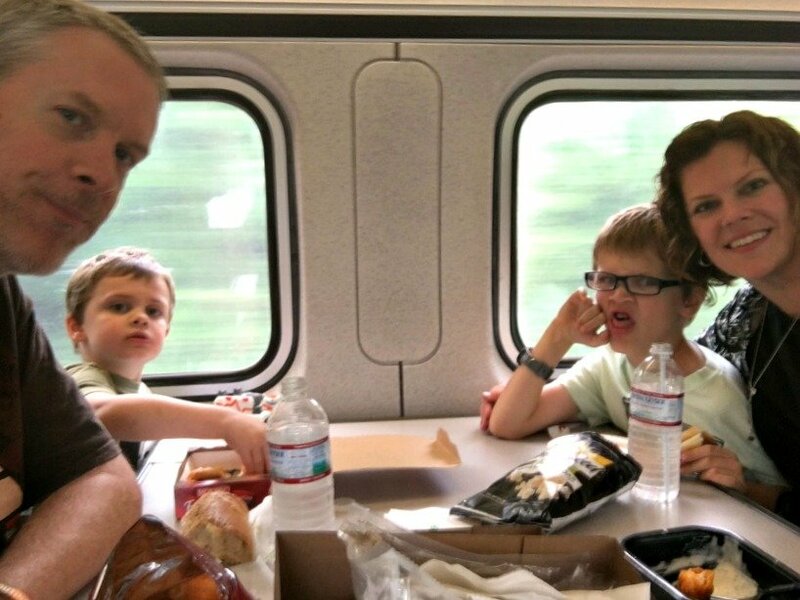 Since our kids had never traveled on the train before, we wanted to let them experience the cafe car so we ate the train food. It was passable, but next time we’ll bring our own. My boys loved not having to sit with buckles on for the whole trip. Having the ability to stand up and sit down at will was a huge plus for us. Calvin especially was thrilled to stand up while the train was moving. The whole concept was so foreign to him it was really fun to watch. 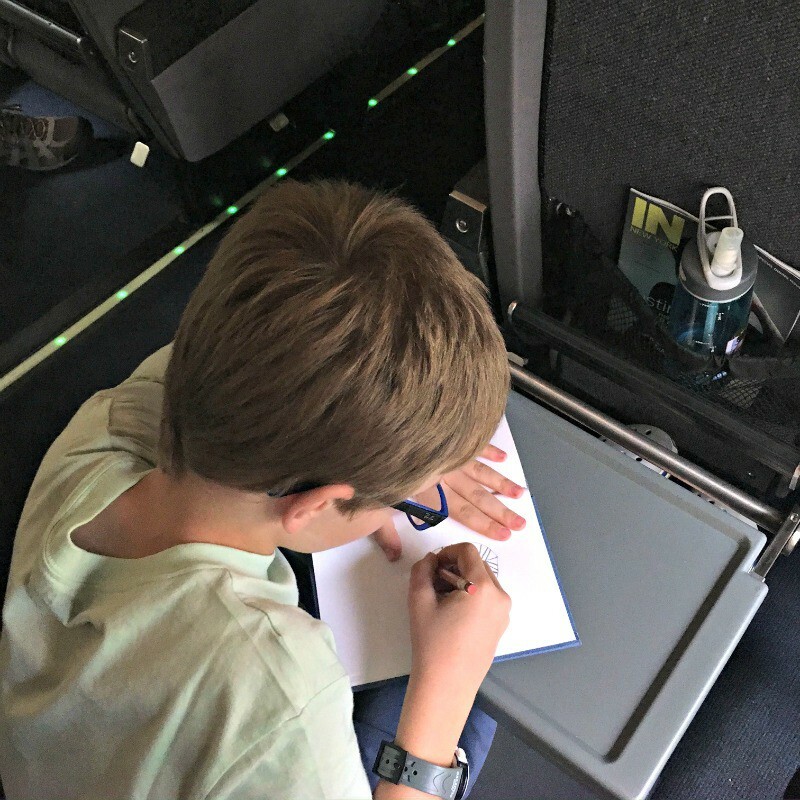 Getting the kids to and from the bathroom was simple and as easy as could be expected while still being a public restroom…on a train. But hey, I’ll take my wins where I can get them. We were able to stretch out and relax with tons of foot room, which was awesome for Jerry! He is typically our driver so not having to worry about that was a nice change for him. And have you seen the size of the seats on a train? Though even he can make them appear small. Because of course he can. Tip: On the way up, we checked our small roller suitcase but in hindsight it was totally unnecessary as the overhead storage is huge and plenty big to have brought it on board. Coming home we didn’t check anything and it was so much easier. 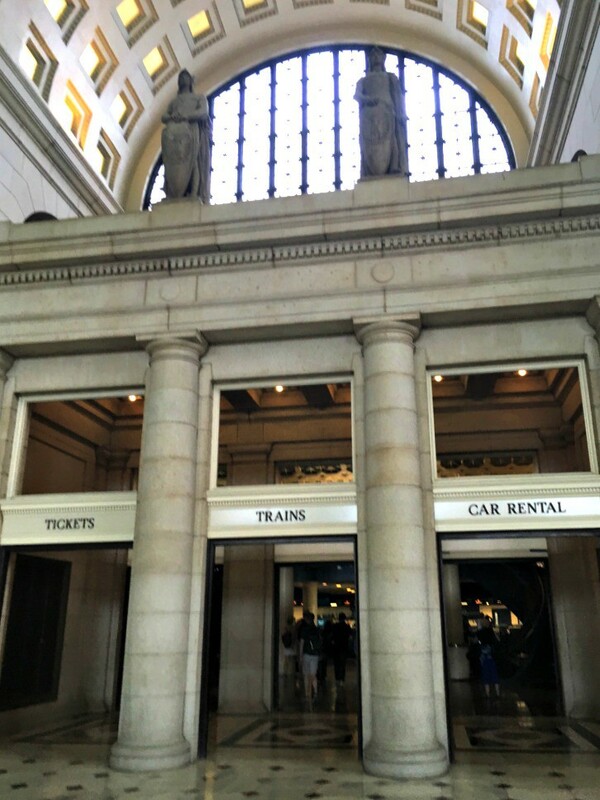 Once we got to Union Station, we just had to find our bus to get to our hotel. We enjoyed a media rate at the lovely Embassy Suites Convention Center location and we loved how convenient it was! Walking was our preferred transportation most everywhere, but thanks to our friends at washington.org, we had some passes to use on the DC Circulator, which brought us from Union Station to right down the street from the hotel. In my opinion when it comes to vacation, getting there is half the fun! Taking the train and experiencing different forms of transportation throughout the weekend was fun for the boys and gave us a great look at the city without having to navigate or worry about parking. 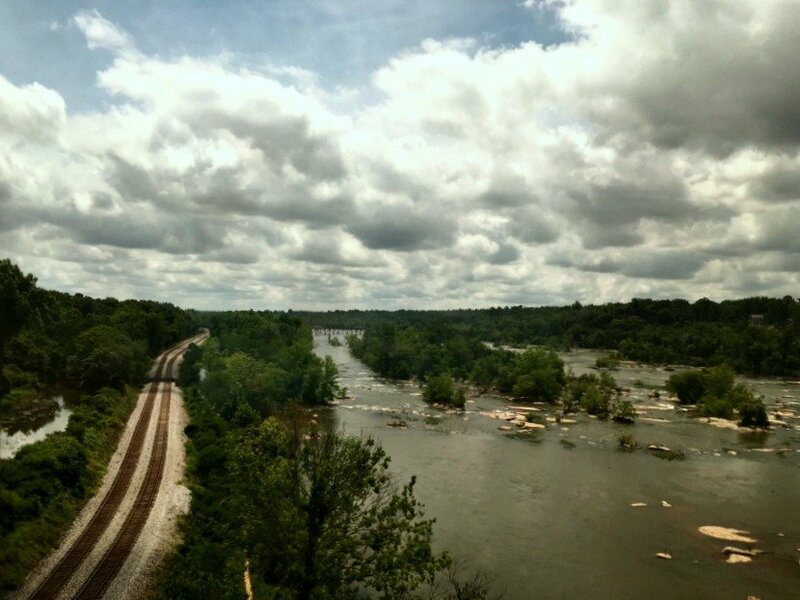 I highly recommend train travel for a trip like this. The kids loved the adventure and it got our weekend getaway off to a great start! 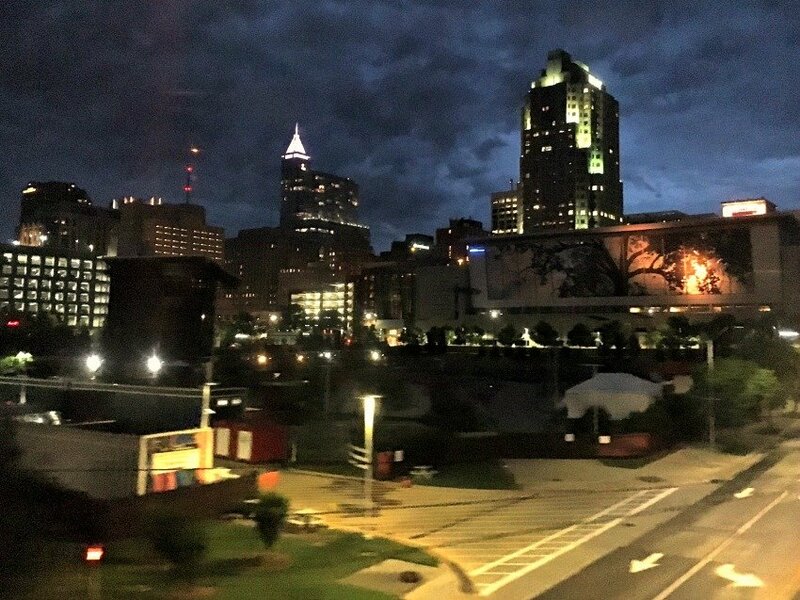 Not to mention the awesome view of the Raleigh skyline as we arrived back home. I can definitely say we’ll be traveling by train again. 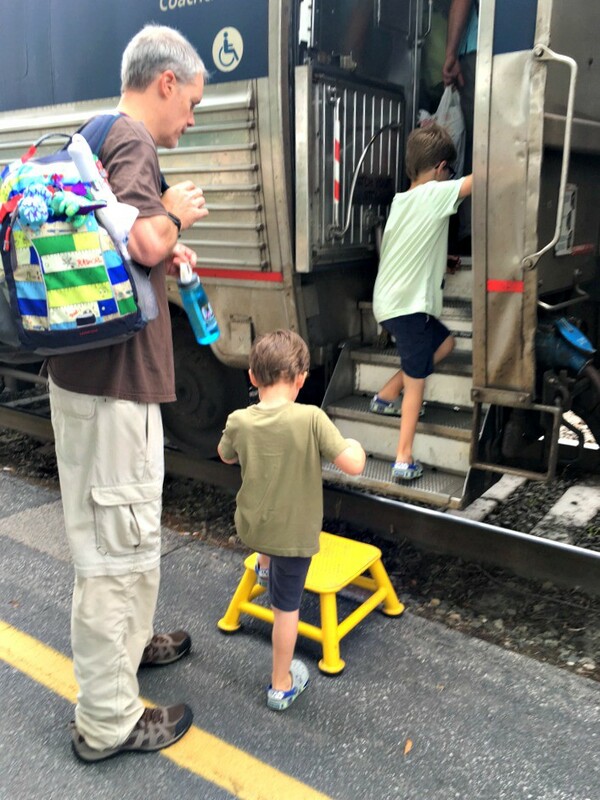 Have you traveled by train with your kids? What are your tips? Is the Embassy Suites Convention Center Washington DC Good for Families?